Still, I know quite well that next fall needs to look more official than this year and that is one of the reasons why I wanted to check out Explore Flight! which is a newer title from Nomad Press. Explore Flight! is written/designed for ages 7-9. I could hand the book over to my son and he could read it for himself but we'll make it a group effort and involve the four year old as well. Upon opening up the book you are given a timeline of the history of flight. Moving on you are given some basic information and "words to know" as you dive (fly?) into this subject. 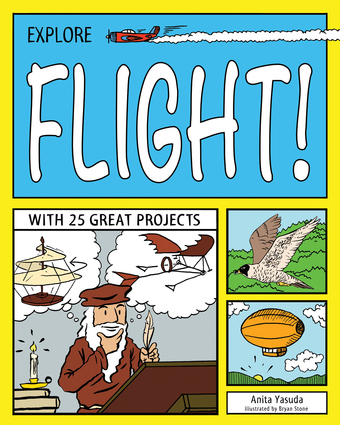 All throughout the book we learn about scientist and explorers who dreamed about flight and made it possible for humankind. Litered liberally through the pages are experiments which you can conduct which are age appropriate. For example, the opening experiments involve flying seeds and leaves and also ye olde air resistance experiment where you drop things of varying weight and see which falls more quickly. History and science are explored simultaneously with discussions of technology and the flight of the Hindenburg. (Of course, anything that adds the historical perspective is going to catch my attention and hold my interest.) The experiments increase in difficulty and complexity as you go along and you'll find yourself building a mini hot air balloon and/or learn things like Morse Code. It looks like tons of fun and the information is laid out in a way that is easily comprehendible. I think this book is a good fit. Especially for young boys who believe they can fly, regardless of the evidence. Many thanks to Nomad Press for sending the above title my direction in exchange for my honest thoughts! This looks PERFECT! Thanks for sharing!! Isn't teaching kids fun? This book does look like one mine would enjoy. Also, for what it's worth, we have been using the Apologia science curriculum, although I modify and tinker like I do with everything. It's a bit above your kids' level, but I just have my younger ones skip the longer words and harder concepts.